The capacity of the railway in the first stage will amount to 1.4 million passengers and 5 to 7 million tons of cargo per year rising to 15 to 20 million tons in future. It will be possible to take a train or send cargo directly all the way from Russia to India sometime soon, via the Azerbaijani border town of Astara, the Chairman of Azerbaijani Railways Javid Gurbanov has informed journalists. A new railway route from Russia to India, via Azerbaijan, will soon be built, Javid Gurbanov, the Chairman of Azerbaijani Railways CJSC told journalists. 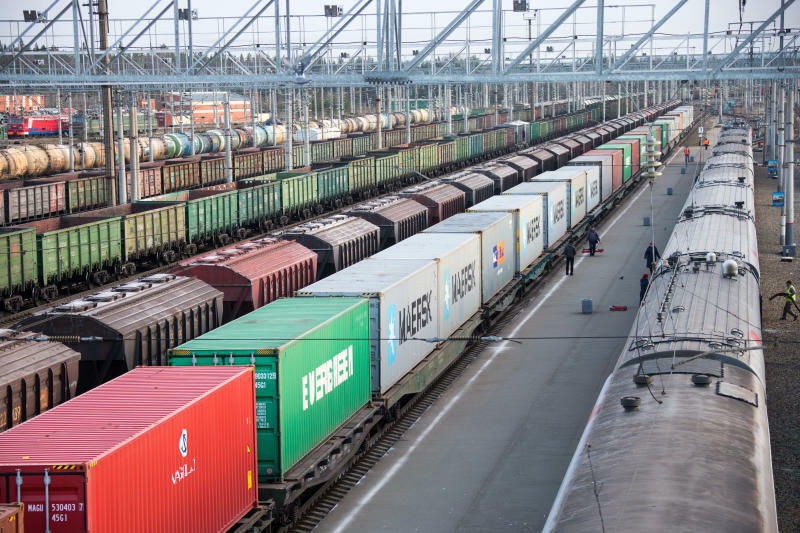 Sohbet Mammadov, correspondent of Nezavisimaya Gazeta in Azerbaijan, writes that Gurbanov said that within the North-South Corridor, freight trains would run all the way from St. Petersburg and Helsinki to India. The Chairman of Azerbaijani Railways said Azerbaijan will meet the first train following this path in the coming weeks. Gurbanov said the route of the first train would be from the Indian city of Mumbai, on by ferry to the Iranian port of Bandar Abbas, thence by rail to the Iranian city of Rasht. Because there is no railway line to Iran’s northern border, the cargo would be delivered by truck to the Azerbaijani border town of Astara, where it will again be placed on rails and continue to Moscow. The new route will be tested for the first time, actually constituting the route of the North-South corridor project. In the meanwhile, Azerbaijani Railways has swiftly carried out work on construction of their section of the road; a little more than eight kilometers; from Astara to the Iranian border. “About 100 pieces of equipment are being used on this section of the new railway line. So far, 280,000 cubic meters of sand and gravel have been laid, and 14 sewage drains are being built, seven of which are already finished. At the same time, work is being carried out to transfer power lines and gas pipelines and residential premises that run through the territory”, the spokesperson said. The speed of work has been expedited because Azerbaijani President Ilham Aliyev has instructed the builders that building bridges and laying the railway line to the Iranian border must be complete before the end of this year. This deadline was set by the heads of Azerbaijan and Iran. After the railway link is ready, they will announce the commissioning of the first stage of the North-South project. Russia, Iran and India signed an agreement on building a North-South International Transport Corridor on September 12, 2000, in St. Petersburg. The Agreement entered into force on May 21, 2002. Azerbaijan joined the convention in September 2005. The North-South project, involving the construction of a railway line, promises greater economic benefits through improved connectivity, compared with other international transport routes. This project will create conditions for more efficient and swift shipment of cargo between the Persian Gulf and Europe, which will have major financial advantages. Local analysts say the North-South transport corridor offers great opportunities for all participants – the sending countries, the receiving countries, and the transit countries. The North-South corridor will become a multi-modal transportation route for passengers and goods travelling between St. Petersburg and the Indian port of Mumbai. According to preliminary estimates, the capacity of the railway in the first stage will amount to 1.4 million passengers and 5 to 7 million tons of cargo per year rising to 15 to 20 million tons in future. A total of 22 railway tunnels and 15 bridges will be built along the railway track.